It’s the end of December. It’s cold. (Ok there is a low of 44 degree today in Santa Monica, but I’m cold) This is the time of year when I crave heavier foods and drinks to pack on a few pounds to keep me warmer. Kind of like a bear. I have loved Egg Nog for as long as I can remember. Obviously, when I was 12 I enjoyed it right from the carton. Nothing added but a sprinkle of nutmeg to make it a little more attractive. I would drink it whenever I felt like it, like a melted milkshake, as a dessert or just after school because it happened to catch my eye from the top shelf of the refrigerator. Since 1996, my Egg Nog tastes have evolved a bit. I’m not sure what year it was (or if I was even of legal drinking age), but I remember having my first spiked nog at my Uncle Pat’s house one Thanksgiving. The Bylsma/Shurtleff Thanksgivings are well-known for their debauchery. Especially since Nicki turned 21 (who am I kidding – probably well before Nicki turned 21). Multiple bottles of bourbon are consumed. Everyone (even Mom) takes a celebratory shot of Maker’s Mark. It is one of the most amazing family gatherings you will ever attend. Yes, my first nog was absolutely drank at Uncle Pat’s. Looking back, I’m sure it was 3 parts Bourbon and 1 part Egg Nog, considering the consistency of the drink. I remember just looking at it and thinking that it was really watery-thin for egg nog. And then I remember tasting it and thinking I was just drinking milky booze. And then I remember drinking a little more and thinking, this is fantastic. You always hear of Egg Nog being mixed with Bourbon or rum or brandy. It’s a dark liquor kind of drink. But recently a friend sent me a link to “Baltimore Egg Nog” and naturally, I had to try it. It sounded like the best thing since “Crabs For Christmas”. On first glance, the recipe looks like any other Egg Nog recipe. Separate the egg yolks from the whites. Sugar, cream, lots of booze. But the thing that caught my eye about this particular recipe (other than it hails from my hometown, of course) was that it used Madeira wine. Never heard of Madeira? It is actually a fortified wine from the Island of Madeira, Portugal, which was a regular port of call for ships on their way to the New World in the 1800s. The wine became very popular in the Americas because of its ability to make the long, hot boat ride from Europe without spoiling. In fact, the high temperatures and continuous movement became a part of the Madeira wine making process because of the delicious results it was producing. To this day, Madeira wines are subjected to intense heats and oxidation to get that really unique flavor. But that’s not really why I know Madeira. It is still available (though not popular) as a fortified drinking wine, almost like a Port, but Brad introduced me to Madeira because he cooks with it all the time. I know he uses it in a few of the recipes he learned over at Just a Taste. Spicy Shrimp. Braised Greens… And now that I’m doing my research, it’s clear that Madeira is a great cooking wine. It has essentially already been “cooked”, so when it is used in recipes that require a lot of heating, it loses less of its flavor as it cooks. I love when he gets all chef-y on me. So anyway. Turns out this particular Egg Nog recipe was published in a Baltimore cookbook back in the 1940s and has since been called “Baltimore Egg Nog”. But upon further research, the recipe can be found in The Bartender’s Guide: How To Mix Drinks, published in 1862. Just about the time that Baby America was still importing their wine from across the pond. And just about the time that Madeira was still all the rage. So if you’re like us and just happen to have a bottle of Madeira wine hanging out in the kitchen, give this recipe a try. It’s vintage. – Beat the egg yolks with a hand mixer. Add sugar and spice then continue to mix until frothy and the sugar is dissolved. – Slowly whisk in alcohol into the yolk mixture. – Slowly whisk the milk into the yolk mixture. – Beat the egg white until soft peaks form. – Fold egg whites into the yolk mixture. Store in refrigerator until chilled. 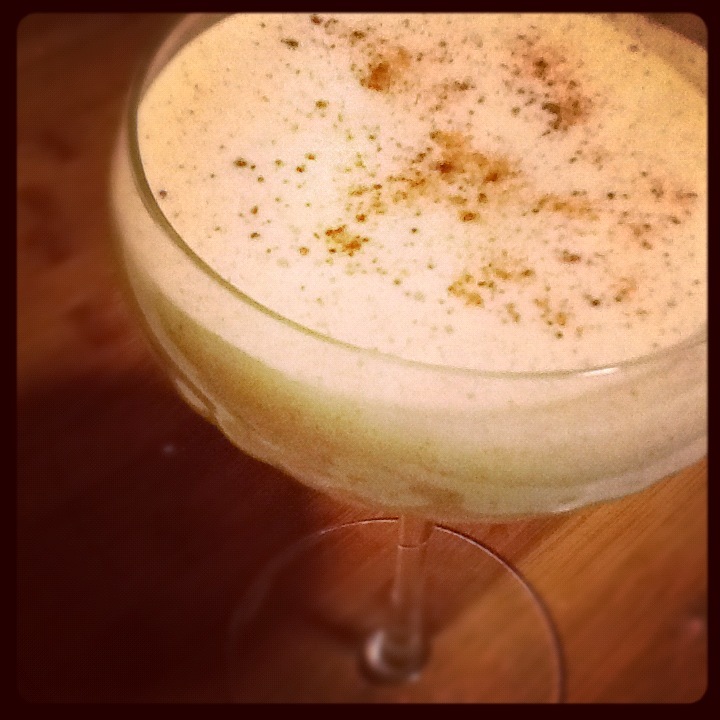 Probably done with eggnog for a bit now, but expect a lot more recipes and tidbits to come!